It is that time of the month, where myself and other ladies of the Stylish Mondays group get together and style a theme. 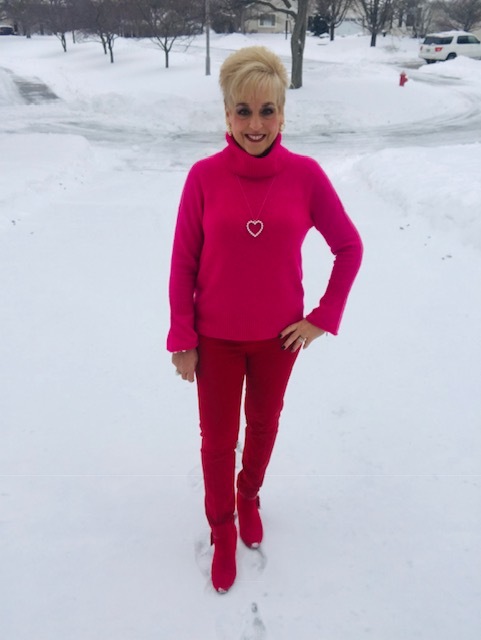 This month the theme is Ladies in Red for Valentines and for heart health in February. I myself am a red lover, yes my hair is a given, but I also love to wear red. It is such a bold and striking color! 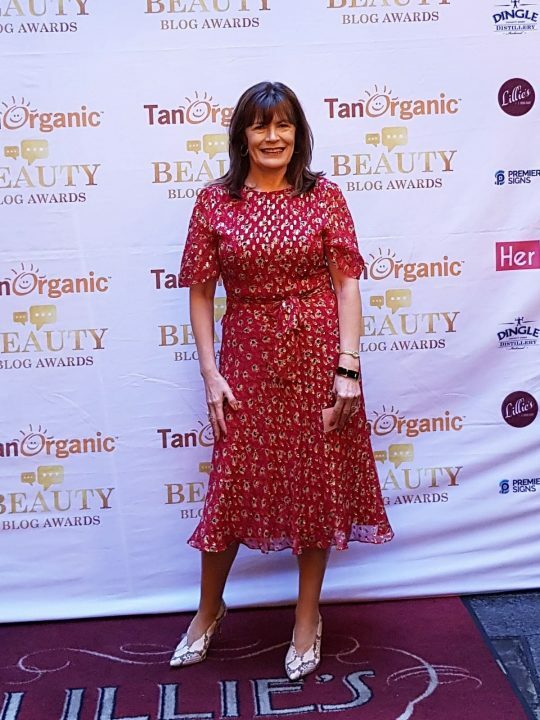 First, before I talk about this outfit, I mentioned Friday, that I was featured, Elegantly Dressed and Stylish blog, on the wonderful blog, You Look Fab. When you get a chance, I’d love for you to pop by. I was thrilled for my style to be featured there, as I often admire the styles on this blog. RED. 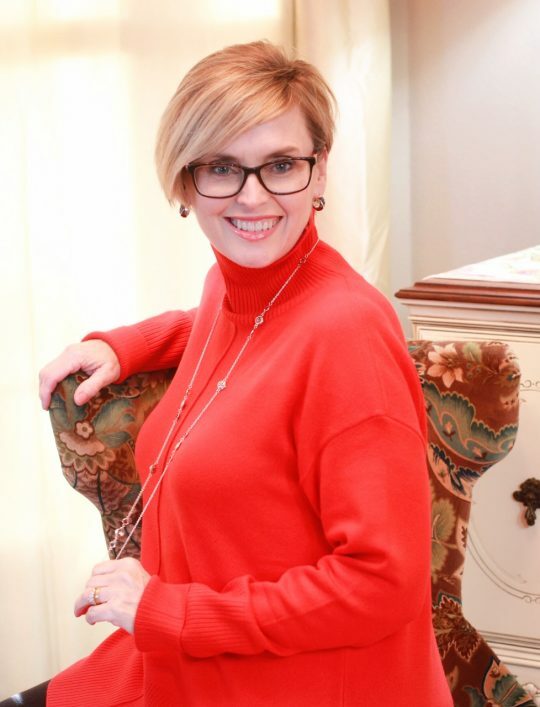 It is one of those colors that you either love to wear a lot of, as it seems to exude confidence and a “want to be seen” look, or you still love it enough to want to incorporate it in an accessory for a punch of color. 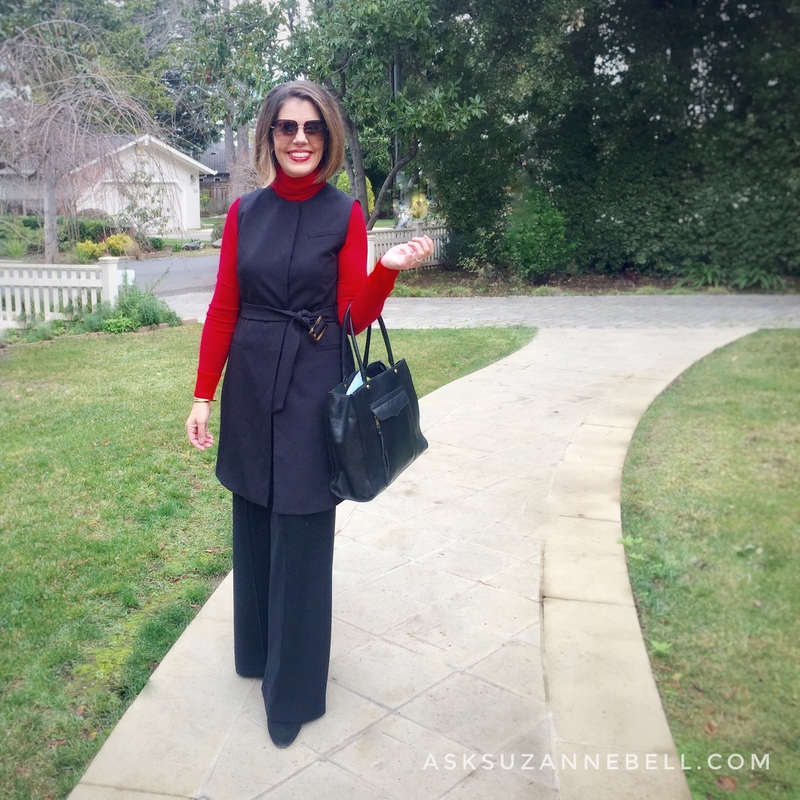 I will wear red for a pop of color with neutrals, or go bold and feel fabulous in a red dress. It really depends on my mood! This outfit is one of those bolder looks with this red blazer I was gifted from the company Misook. ( last year). 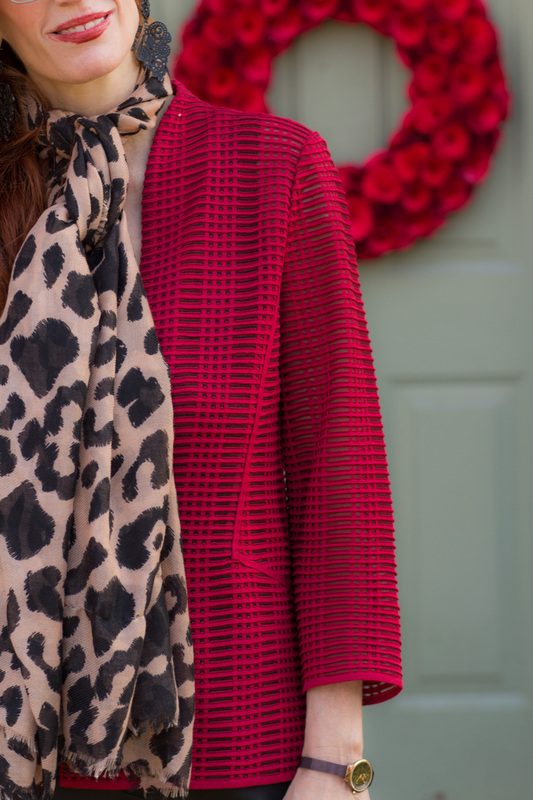 I love the classic combination of red and black and another favorite by adding leopard print to the mix. I wanted to keep the long line to my legs and chose to wore my Jambu black booties. I could change it up and add a second leopard pattern with my leopard boots, or pattern mix with a complimentary patterned bootie. 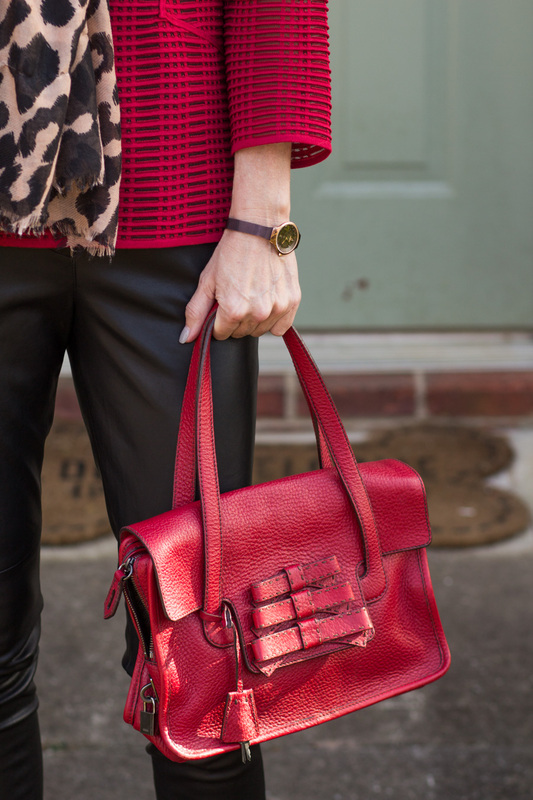 I am wearing a silk tank under the blazer, my favorite Ann Taylor faux leather leggings and brought out my Christmas gift from hubby, my red Prada bag. I love the bow details that add a feminine touch to the look as well. Since today is Stylish Mondays, and we share a theme once a month, the ladies are going to be styling red. Do check out their blogs and how they are going to be styling it. 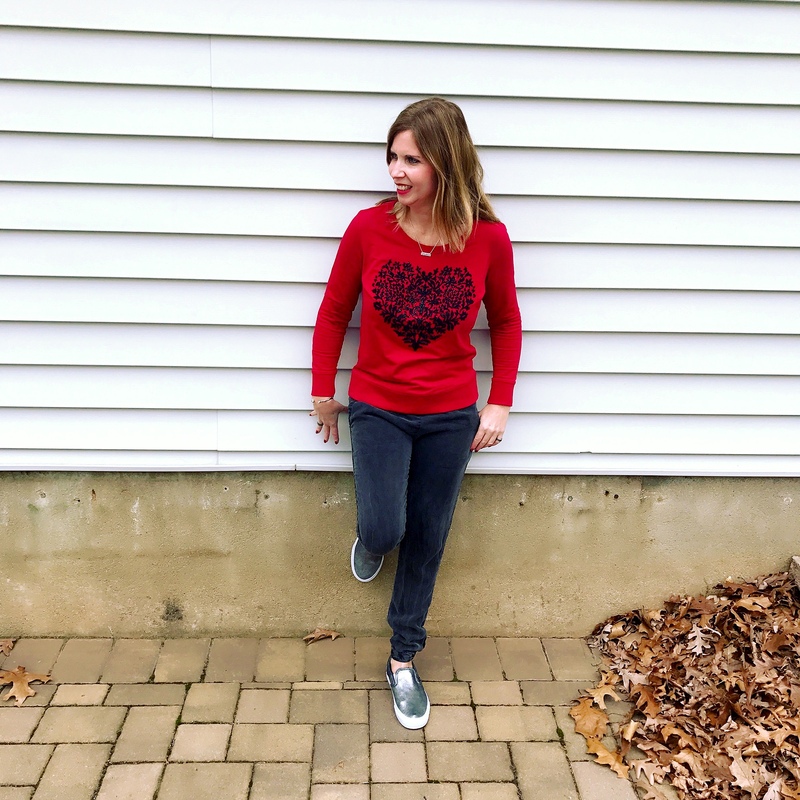 I have styled red on the blog for Holidays like Christmas and Valentine’s Day, but it really is a color you can wear anytime you want to stand out or just feel good! It is always the time of the year it seems when we take stock of our health. January, the gyms fill up with people longing to get healthier. Do you think about your heart health? Since I have Ehlers-Danlos, and it is a connective tissue disease, my heart can be affected. More often, it is the Vascular type of this illness that has more concerns, however, I do go to the cardiologist and get checked. My Dad, brother, and sister have all had A-Fib irregular heartbeat where the Atria beats too fast or Atrial Fibrillation. ) I have been tested with an EKG recently showing that I do not have A-Fib. If it runs in your family, it is good to get tested. Nutrition is important to me, and I love to eat a healthy diet. It makes me feel better, and I do enjoy eating this way. I find that if I eat healthier, and have vegetables and fruits around, I will snack on them. I also find I crave healthier foods by eating this way. I do love my cheese though.!. LET HAVE SOME FUN AT THE STYLISH MONDAY LINKUP. AND DO STOP BY THE OTHER BLOGGER’S BLOGS TO CHECK OUT THEIR POSTS AND HOW THEY STYLED RED!. 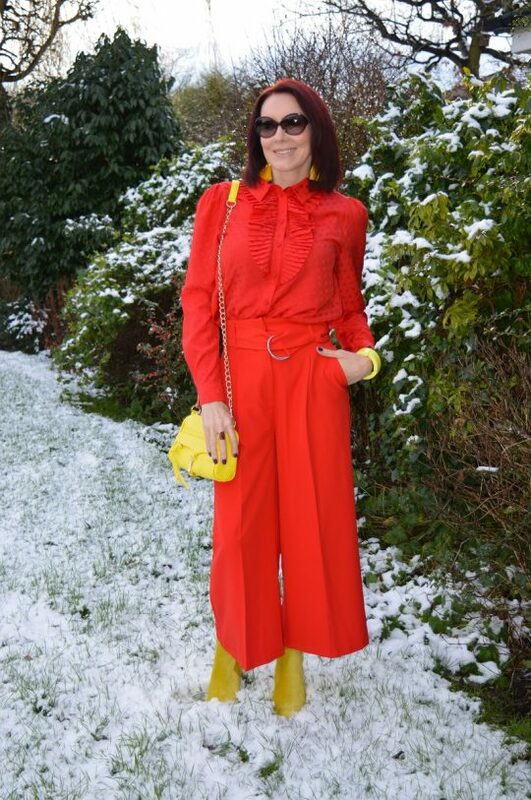 Robin of Hello I’m 50ish blog and I must have been channeling similar fashion vibes! Love this look! LINKUP BELOW, YOU CAN CHOOSE POSTS TO SHARE AND MEET OTHER BLOGGERS. CLICK ON THE INLINKZ BUTTON TO ADD YOUR POST. i AM ALSO SHARING SOME AFFILIATE LINKS BELOW, FINDING SOME RED ITEMS YOU MIGHT ENJOY, AND JUST IN TIME FOR VALENTINE’S DAY! Absolutely gorgeous! 😍😍 Love all the red! 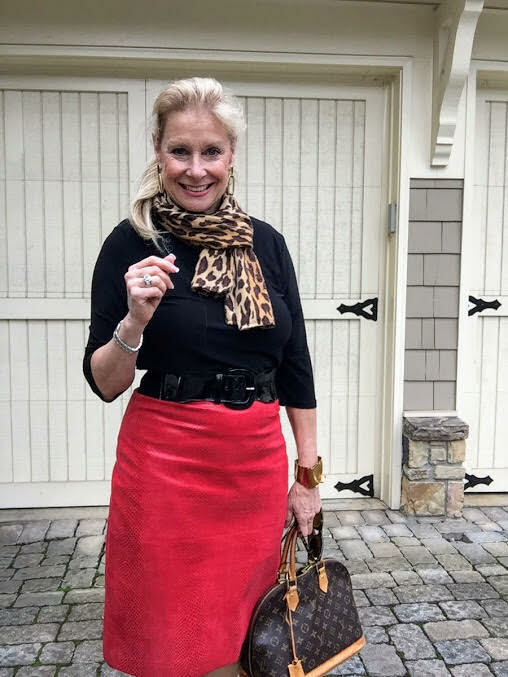 I’ve always loved red paired with animal print, this color looks great on you! I love this red look on you and the pop of leopard is perfect. 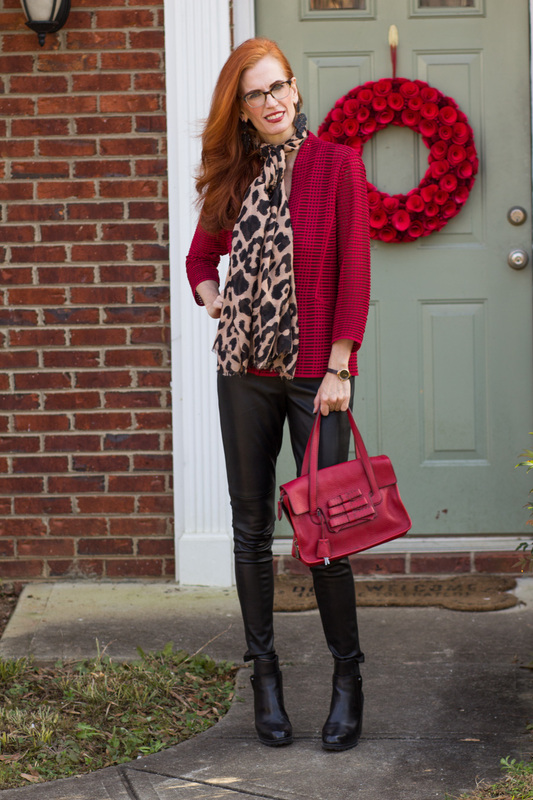 I wore red and leopard on my most recent post, too! 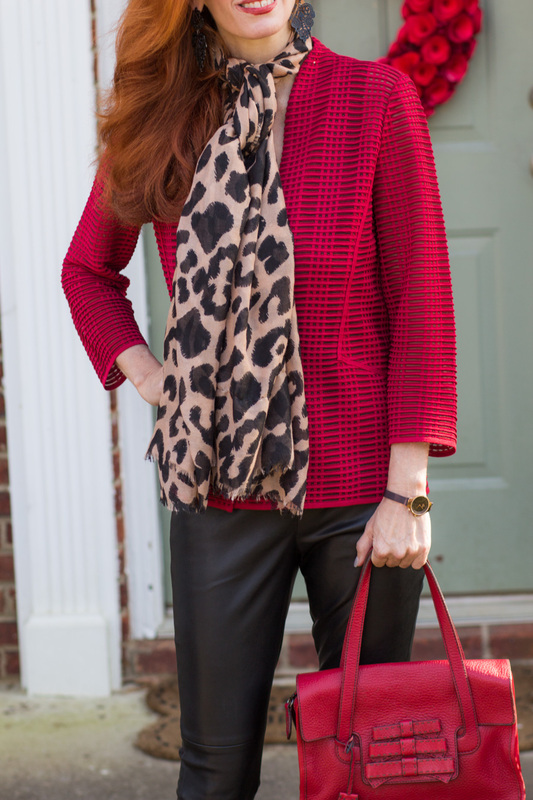 You are stunning in red Jess and love how you mixed the leopard scarf with your look, so chic! Thank you for the link up my stylish friend!! You look stunning! Red and Green are two colors I rarely wear. I like red on me during the summer. However, with Valentines Day just around the corner, I have been wearing lots of pink. Gorgeous as always Jess, but I have to say my favorite piece is your gorgeous hair! You wear red so well! Such a fun collaboration! I look forward to future themes! Funny how we were twinning our red with leopard print! I appreciate you being a part of the stylish Monday sisters! I look forward to seeing you again tomorrow! I love an excuse to wear red. Fab outfit. Do pop over and join my Monday #linkup. I love the idea of wearing red for such a good cause. Love this. You look beautiful in red! I love your outfit and that bag is so pretty. I think you will use it a lot throughout the year! Red is perfect for so many occasions! Stunning as usual my friend! I love the shade of red you chose and of course red is my favorite with leopard! What shade of lipstick are you wearing? I am always on the hunt for the perfect shade. This was a wonderful theme for this month – heart health is so important. Especially for women and so much of the time I hear about women having heart attacks and didn’t even realize that’s what they were having – so scary! You look adorable & stylish in the outfit. This looks are perfect & fab for valentine’s day. Kisses!